Where do I use my Evans Cycles voucher code? Browse for a deal at NetVoucherCodes to use at Evans Cycles. Select the link and head over to the Evans Cycles website. Select products you would like to buy and add them to your basket. Select ‘Checkout’ to review your order. Click ‘Got a Promo Code’ and enter your discount into the box provided. Click ‘Apply’ and enjoy your discount. "Up to 42% off with the ride to work scheme." "0% finance on all bikes over £499." "Up to 30% off in the clearance section." "Save up to £350 when you trade in your bike." Wherever you’ll be cycling too, through or from, you can use one of our Evans Cycles discount codes to save cash on their huge range of BMX, road cycling, mountain biking, folding bikes and kid's bikes. Evans Cycles is happy to help with every aspect of choosing and purchasing your bike, from deciding which is the right bike for you with their impartial buying guides and their team of cycling advisors at their dedicated call centre, right through to the aftercare to ensure you get a long life of healthy cycling from your purchase. There’s no shortage of opportunities to save, either. Free delivery on all orders, regular special offers, free gifts, participation in the Ride2Work programme that offers employees of participating businesses up to 42% discounts on bikes at no additional cost to the employer - and that’s before you factor in your Evans Cycles voucher codes. Offering bike insurance and a Price Promise to match a competitor’s offer, Evans Cycles are a great choice for anybody looking to get advice on purchasing a bicycle, wherever you are in the UK. As you will have guessed, Evans Cycles specialise in Bikes. If you require a little more than your standard bike Evans Cycles is a great place to start. With a range of products for both amateur and sports cyclists, Evans can satisfy all your biking needs no matter what bike or equipment you require. Find Adventure Road bikes, BMX Bikes, Touring Bikes, Hybrid Bikes, Kids Bikes and more, all at great prices, from big name brands. If you prefer to browse in store before you buy, find your nearest Evans Cycles. Simply visit the Evans Cycles website and click on find a store. Enter your postcode or town and find all the nearest Evans Cycles to you. Once you have located your closest store you can use click and collect and pick up your order from in store. Or you can simply just browse before you buy. Evans Cycles hold regular sales and offer's on bikes and other products through their clearance section. You can find discounts throughout the year on clothing, bikes, helmets, accessories, parts, maintenance, training and nutrition. 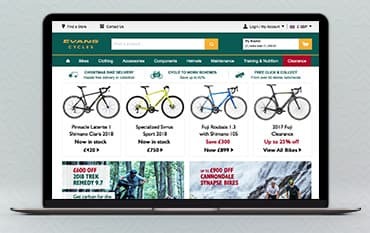 To stay updated on all the latest and upcoming sales sign up to the Evans Cycles Newsletter and get the heads up and save you money on your next order. How can I contact Evans Cycles? What are your online payment methods? Evans Cycles are able to accept the following methods of payment online: Credit / Debit card, PayPal, Finance, Gift Cards/ E-Gift Vouchers and Cycle to work vouchers (Ride-to-Work certificates & Cyclescheme vouchers). Please note that online payments are taken upfront. Evans Cycles it the UK’s largest specialist cycle retailer and stocks a huge range of over 25,000 bikes. With one of our Evans Cycles Promo Codes you can make great savings on road bikes, mountain bikes, BMX, touring, kids bikes and much more. Evans stock loads of well-known brands such as Scott, BMC, Dawes, Kona, Raleigh and Ridgeback and with their Price Promise they will beat any price online. They also stock a wide range of cycling accessories, helmets and clothing meaning that for all things cycling you need look no further than Evans Cycles. We are constantly on the hunt for first order Promo Codes for Evans Cycles to help you with your money saving. Our experts check dozens of sites for secret codes including NHS discounts, student sites & social media channels saving you time & money!